Television can be a ready baby sitter in the living room, but will it work on school buses? The Garland school district is experimenting with playing educational videos on a school bus to help cut discipline problems. For $1,500 per bus, Carrollton-based AdComp Systems installs a 26-inch flat screen TV at the front of the bus. The screen plays videos supplied by NASA, the Discovery network, History Channel and others. The similarities between BusRadio – which closed its doors last September after a four-year campaign by CCFC and Obligation, Inc. – and Bus-Ed-Safe-TV (BEST) are striking. Like BusRadio, BEST is claiming it will improve student behavior and touting its plan to air safety messages and PSAs in its pitch to school districts while downplaying its commercial content. The Dallas Morning News is even reporting that BEST will have no commercials. Even if that were true, it’s still a terrible idea. At some point we’re going to need to stand up to the flat-screen invasion and the ubiquitous blaring TV's that compete for our attention and with our conversations at seemingly every turn. Since children 8-18 already spend 7.5 hours a day with media and excessive screen time is linked to poor school performance, keeping televisions off of school buses might be a good place to start. As for the claim there will be no commercials, the website says only that BEST won’t run “Direct commercial ads that parents can object to and are not good for kids” or air violence or sexually explicit material. That’s not setting the bar very high. 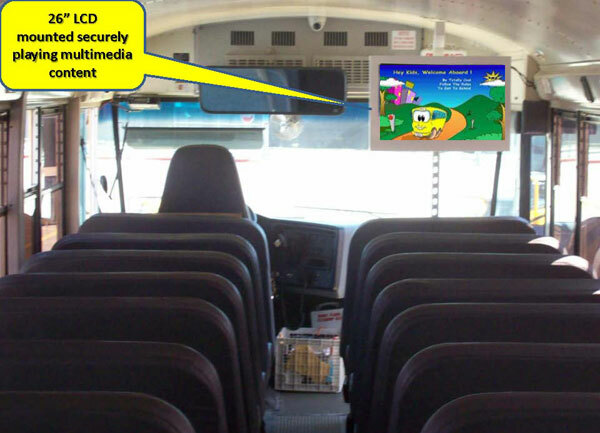 As we learned with BusRadio, it’s not just the content that parents object to – it’s the very business model of forcing children to consume media and marketing on a school bus. Before the BEST team proceeds any further, they should do their homework. They could start with the more than 1,000 comments that parents submitted to the FCC in opposition to BusRadio, or by reading how parents in Louisville, Montgomery County, and cities and towns around the country organized to keep the company out of their school districts. Because if BEST, like its failed predecessor, underestimates parents’ determination to keep their school buses commercial-free, it’s sure to be the next BusRadio. Who knows, maybe the MTA here in NYC can put those TVs in their buses to make some money so we can keep the buses rolling. For those that don't live here, they are gutting the bus & subway routes this weekend, all due to their very poor financial management (which when combined with the terrible economy makes it even tougher to climb out of the whole). $1500 per bus the districts don't have to pay for programming the kids won't watch all so some private company can turn our kids into a product and make money the schools will never see. This is clearly a bad idea. I viewed the B-E-S-T website and it clearly states that there is no commercial advertising. I think it could be a good idea, as long as the company lives by that. These days technology can be used to make our lives better. Can anyone comment on the craziness that goes on in School buses, cause kids are not supervised and this could be a good way to make their ride safer by playing safety related messages. Children already have too many screens competing for their often too divided attention. TV, internet, video games, cell phones. Bad enough people put TVs in their cars to sedate their children. I see no reason to inflict yet another media barrage on children in one of the few places currently free of it. If you think this is a good idea, I suggest watching some of the advertising targeted at children, like the one for an electronic cup and ping-pong balls. Such a product sounds ridiculous to an adult, but it's frightening to watch kids get sucked in by it. And I think anyone who believes this system won't have such ads is fooling themselves. It has to be paid for somehow and most of the schools can hardly be expected to afford it. The only goal of the B-E-S-T program is to provide a safer environment for the kids travelling to and from school. It doesn't look like they are trying to sell any advertising. While watchdog organizations are good and required, one should be careful not to suppress innovative and brilliant thinking. Lets be fair and give them a chance to present their viewpoint. It might just be good for the kids. Before i accuse them, why not i give them a chance to present their ideas ? The website says that it will help with discipline and bhaviour on the bus. I will kill myself if this happens. Also, I disagree with 80% of everything on this site.